Ronaldo has been in the headlines for all the wrong reasons. Cristiano Ronaldo, the self–proclaimed best player in the world, is having an eventful Euro 2016. Portugal was expected by many to cruise through Group F, but Fernando Santos’s side has sputtered though the group stage, collecting just two points after two matches. 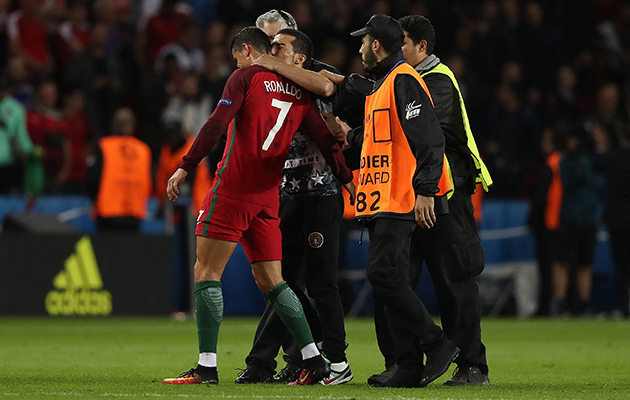 Ronaldo in particular struggled to find his form thorugh two games—though he certainly managed to find unnecessary controversy. Here’s a look at Cristiano Ronaldo’s drama-filled Euro 2016 so far, including two great goals in Portugal’s group stage finale. Iceland, the smallest country competing at Euro 2016, is one of the feel–good stories of the tournament. But Cristiano Ronaldo apparently doesn’t share your appreciation for heartwarming underdog stories. After Iceland and Portugal played to a 1–1 draw in their group stage opener, Ronaldo scoffed at Iceland’s post–match celebration. If anyone knows about over-the-top celebrations, it’s Ronaldo. There aren’t many players you’d choose ahead of Cristiano Ronaldo to take a critical penalty kick. In last month’s UEFA Champions League Final, Ronaldo converted the winning penalty in a shootout to win the title for Real Madrid. In Portugal’s second Group F match, Ronaldo had a chance to win the game for Portugal in the 78th minute after his team was awarded a penalty. But Ronaldo’s attempt, a hard kick to the lower left corner, rang off the post, leaving the game scoreless. Ronaldo appeared to give Portugal the lead a few minutes later, but he was offside. Ronaldo had 10 shots against Austria, but he managed just three on target. Through his first two games, Ronaldo had 20 shots and no goals. Ronaldo also took a selfie with a pitch invader. Luckily for Portugal, the team’s defense has proven tougher to penetrate than stadium security. This actually happened. A reporter for CMTV approached Ronaldo and asked him whether he was ready for Portugal’s final group stage match against Hungary. In response, Ronaldo tossed the reporter’s microphone in the lake. Unlike his penalty against Austria, at least Ronaldo hit the target this time. Just when you forget that Cristiano Ronaldo is one of the two best soccer players in the world—well, he does this. With the goal, Ronaldo became the first player to score at four different Euro competitions. And it came at a critical time: Portugal had just gone down 2–1 to Hungary. After Ronaldo’s equalizer, Hungary took a 3–2 lead before Ronaldo struck again, this time with his head. The game finished in a draw, and Portugal advanced to the knockout stage despite finishing third in Group F.